Mitten State Sheep & Wool : Shouldn't Your Sheep Be in the Barn? Winter has been a cold one! How does that affect our livestock? I always hear some concern for our sheep, from at least a few people, that they are out in the snow and not tucked away in the barn. I have shared this in the past, but will again-"Sheep are Tough". My flock prefers to be outside. We have less health problems when they live out on the pasture. They have great survival instincts. They stick together, know where the windbreaks are, and they tend to stick close to the barn when the weather is really unpleasant. We do have to feed extra bales of hay, and make sure the hay is good quality. Their nutritional requirements are higher with the colder temperatures and the hay produces body heat when it is digested. We also make sure they have clean water. I know that some sources say that they can eat the snow and I know that my sheep have eaten snow, but we still put water out every day. If the weather gets harsh we will move them into the barnyard so they have more protection against the elements. I should add I am talking about adult sheep with wool growth, not sheep that have no fleece or young lambs. If we had lambs right now it would be a completely different story, they would not have the means to maintain their body heat. They would need to be housed, one of the reasons we lamb in the Spring. We also have goats. I love our goats but they are not as hardy as the sheep when the weather turns really cold. It is not their fault, their winter coats just don't compare to those woolly sweaters that the sheep are blessed with. They are the first to be moved into the barnyard and occasionally bought into the barn to help them keep warm. They also have the extra feed requirements. From the looks of it, the colder weather plans to stick around. Time to put on my wool coat and go check on everyone! Wish we had your snow rather than mud. Our sheep aren't as happy as yours :-). I agree, I would much rather have snow than cold rain and mud! I would love to get some sheep guardian dogs in the future. I agree about the wool sweaters. I am wearing one right now! Sandra, I sometimes catch myself feeling like I need to put all my sheep in a barn when it's so cold. Like tonight, I moved them all over to the 2 shelters. It's snowing and the wind is blowing something fierce out there right now. I gave them extra hay and tucked them all in for the night. But most will just stay outside. They are VERY wooly right now too. So I know they are warmer than me. But my goats, they are all fluffed up and won't hardly come out of their barn. People are funny, aren't they? Our goats are the same way. They act like they are dying even in the summer if there is any rain! We do have them in the barn right now. They look very happy about it too! Sheep do like the fresh air and the cold. I had a lean to that they could get out of the elements if necessary but often look out and they would be out in the lot. My big white dogs went nuts when it snowed, they love it. Not all dogs or animals need a warm place...they have coats that keep them warm and often are suffering if you bring them in a heated building. I told one person that suggested that I bring my big dogs in the house...sometime when it is cold outside, you put on all your winter coat, boots, gloves, hat and then come in and sit and watch TV in the warm house. You can get up and take all that outer wear off but your dog can't. Love your sheep. I live down by Battle Creek on Fine Lake, where are you located? I used to live in Battle Creek! We are now about an hour South. Well I think your sheep look nice and toasty. I would be worried about overheating if they were in a barn. I don't have sheep (yet;)), but found this very interesting. Thanks for sharing! Our horses always had a barn to go into whenever they wanted, but they would always be outside in the cold and snow! Even if you led them inside, they would go right back out. And they aren't even covered in wool! :) I think sometimes when we are freezing the animals think it feels great out! One British blogger said Americans are cruel for leaving cats, dogs, and chickens outdoors and not bringing them indoors. She writes that dogs need to be indoors, that a dog house in a garage is cruel. She was not referring to little dogs with no fur. She invited me to never come back because I tried to explain that most cats and dogs will find shelter and do NOT need to be indoors to survive and be comfortable. Hundred of the British and the occasional American agree with her. Growing up, we had all sorts of dogs and cats that stayed outdoors and never suffered. 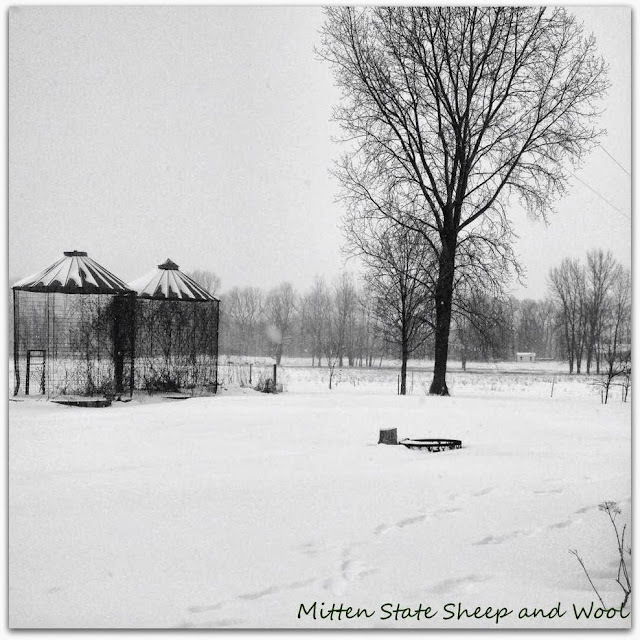 I can imagine that sheep are well-equipped to stay warm enough and know when to seek shelter without having to be locked in during bitterly cold weather. 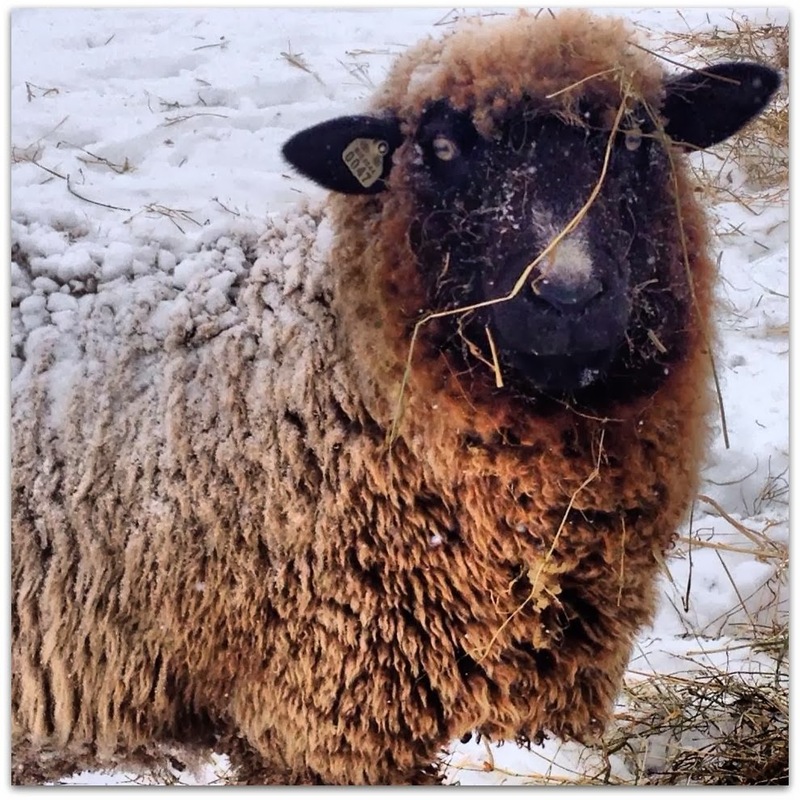 I love the sheep pictures and how you left stray hay on them instead of cleaning them up for the photo shoot! By indoors, she means in a heated house with their owners. I have a friend who brings her sheep indoors if it too cold outside. Since I'm not a sheep owner, have no idea if that is good or not. Yours look happy and healthy in the snow :) Lovely b&w photo! We make sure all the animals have access to a clean, dry shelter, then let them choose. Our animals choose to stay outside 90% of the time (and the shelter is available to them for the other 10%). My favorite quote is "God gave a cow everything she needs to know to be a cow." I think it applied to all animals. The key is to meet their nutritional requirements for the colder weather and otherwise they know what/where they need to be to survive. We have found that since moving to run-in style or open-front style sheds, sun shades, and windbreaks rather than a fully enclosed barns that all the animals now put on a thicker winter coat and we have had ZERO cases of spring pneumonia. They've become hardier. This I s so true!